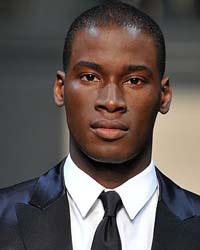 David Agbodji was born in Paris, France, on May, 8, 1987, is an French male model. He began his modeling career in 2008, signed with Re: Quest Management in New York. He made his catwalk debut for Calvin Klein show in Milan (2009). Become the face of Calvin Klein in 2010. David's hobbies are basketball and karate. His parents are from Togo. Featured in music video for Lady Gaga "I Want Your Love" (2015). Vogue Hombre Cover, Archetype, Details Cover, SID Cover, Vamp Magazine Cover, GQ Style Turkey, Antidote, L'Officiel Hommes Italia, Flaunt, Vogue Mexico, Made in Brazil, GQ Spain, Forget Them, Supplementaire Cover, Harper's Bazaar UK, L'Officiel USA, Commons & Sense, Hercules, V Man, Vogue Hommes Japan, Out Magazine, GQ Style UK, Schön, Vogue Hommes, Harper's Bazaar U.S., 7TH Man, The Block, GQ Style Germany, Vogue Paris, Contributing Editor. Walked runway for John Elliott + Co, Ovadia & Sons, Tom Ford, amfAR, J. Crew, Naomi Campbell's Fashion For Relief Charity Fashion Show, Greg Lauren, Public School, Dsquared2, Dirk Bikkembergs, Philipp Plein, Hogan, Corneliani, Kenneth Cole, Vivienne Westwood, Salvatore Ferragamo, Banana Republic, General Idea, amfAR, Ports 1961, Jean Paul Gaultier, Bottega Veneta, Loden Dager. Express Holiday, Perry Ellis, RE: Denim Holiday, Kenneth Cole, Bottega Veneta, Banana Republic, Cole Haan, D&G, Calvin Klein, River Island. Represented by agencies Click LA Los Angeles, Success Models Paris, Mega Model Agency Hamburg, Elite London. What's supposed to happen, will happen. Don't try too hard. Once it becomes obvious much effort was put in dressing it loses. I don't have any style icon.